File contains documents related to questions about federal funding for higher education asked by Samuel Balcom in the Canadian House of Parliament in 1955 when Balcom was a member of Parliament. Balcom asked a series of questions about educational grants to Nova Scotia institutions and received information about the distribution of funding across Canada. 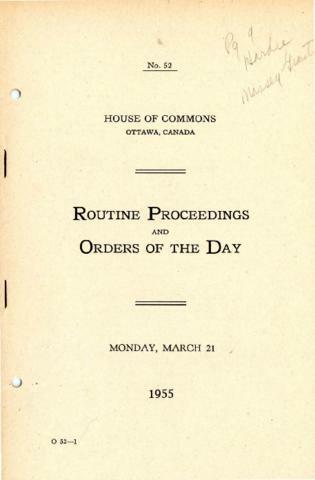 The file contains published accounts of parliamentary proceedings in March 1955 and associated correspondence between Balcom and other persons, such as J.D., McLean, Dean of the Dalhousie Faculty of Dentistry, and Watson Kirkconnell, President of Acadia University in Wolfville, Nova Scotia.